Eaton Uninterruptable power supply in black color, employs 12-Volt 7.2 Ah maintenance-free sealed lead-acid battery for ensuring reliable performance. It has power rating of 1440 VA/1440-Watts and nominal voltage rating of 120-Volt AC. Power supply featuring 8-ft cable, has one NEMA 5-15P input and eight NEMA 5-15R output connection. It measures 17.4-Inch x 3.4-Inch x 20.6-Inch. It supports rack/tower mounting for making installation easier. 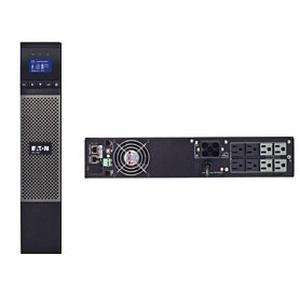 This power supply with LCD graphic display interface, is perfect for network closets and small data centers. Power supply comes with tower stands and 4-post rail kit. It withstands temperature rating of 0 to 40 deg C. Power supply is UL/cUL listed and Energy Star certified.